You are currently browsing all posts tagged with 'exfoliants'. Since this is my first blog post, I’ll set a few ground rules: I will discuss all things spa, including product reviews. I will not hold back. I will answer questions you post. I will not keep my neuroses in check, and I reserve the right to fall into reveries that are only remotely spa related, because I want more than just you spa junkies to read this, too. Welcome to Val The Spa Gal. Please help spread the word. I am a full-time writer and editor. Several years ago, when I first moved to Santa Fe, New Mexico, I took a part-time job at one of the most renowned spas in the US – Ten Thousand Waves. I still live in Santa Fe where, if you throw a stone in any direction, it will likely hit a massage therapist. Over 130 therapists work at Ten Thousand Waves (and boy was it fun trying to learn all their names)! I will share with you what I’ve learned about this business where you lie stark naked on a blanketed table and allow a complete stranger to massage warm oil onto nearly every inch of your body. I’ve lain on hundreds of these tables and crawled back into real life with the requisite lines on the sides of my face, from the face cradle. I’ve been kneaded, scrubbed, heated, oiled, and even hummed to. From the sublime to the evil, I’ve endured every kind of therapist, and every kind of treatment. And I own enough body indulgence products to open my own spa. I figured since I’m a writer, it was time to blog about my spa psychosis. My latest obsession is with The Body Shop’s “Shea Body Scrub.” It is so decadent I’m tempted to eat it. 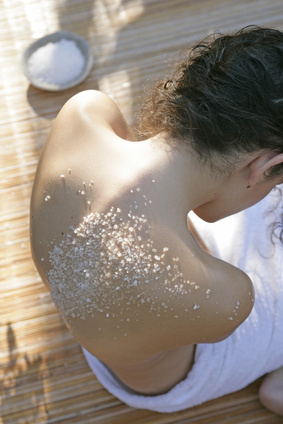 Its salt chunks abrade my body, but then leave a thin glowing sheen on my skin, and I revel in that all day. When no one’s looking, I sneak little sniffs on my arm. As exfoliants go, this one’s on the harsher side. But they used to make a “Bergamot Salt Scrub” that skinned me alive. So, this is an upgrade. Its scent—floral and fruity—is subtle, so your limbs won’t offend when you enter a room. Be careful when you use this in the shower, as its oils cause the tub floor to become slippery. I can’t explain why you’ll love this—it’s hard on the skin, and you might break an ankle slipping in your tub—but its lasting patina is seductive.